In ASP.NET you can remove an item from the web cache by invoking Cache.Remove(string ID). But, what happens when, for some reason, you want to quickly clear the whole cache? There’s no Clear or RemoveAll method in System.Web.Caching.Cache object. You can iterate over all the entries and remove them by their key (or ID), using the GetEnumerator method of the Cache class. Unable to add selected web part(s). Could not load XSL file. The system cannot find the file specified. (Exception from HRESULT: 0x80070002). I’m much fond of the Flo’s excellent Notepad2 editor. 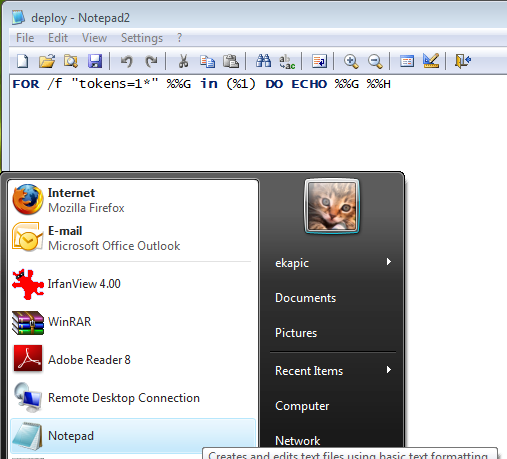 Replacing the simple built-in Notepad is one of the first things that I customize on my developer box. That’s it! No more ugly Notepad…. Sometimes we want SharePoint to import only the user profiles of those user that belong to one specific Active Directory group. In this case we have to modify the import connection query expression in Shared Services Provider. 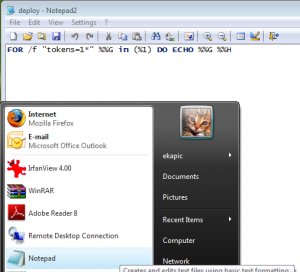 This will ensure that the referenced script file loads correctly. I downloaded the Beta 1 of Internet Explorer 8 from http://www.microsoft.com/windows/products/winfamily/ie/ie8/default.mspx and I was pleasantly surprised that it passes successfully the hard Acid2 test that tests for web standard compliance. It seems that IE8 has a brand new render engine, although the beta keeps an "Emulate IE7" button, just in case.